Just days away from the release of Rollin’ Stone, Stevie Stone’s “808 Bendin” music video featuring Tech N9ne has officially climbed over 100,000 views on YouTube. The vibrant music video first hit the web in late May and had fans buzzing in anticipation of Stevie Stone’s Strange Music debut. Armed with a colossal banger from Johnny Juliano, Stevie Stone and Tech N9ne laid down some heated bars for the popular collaboration. Directed by Dan Gedman of Liquid 9, “808 Bendin” turned up the dial and gave viewers a music video unlike any other from Strange Music. 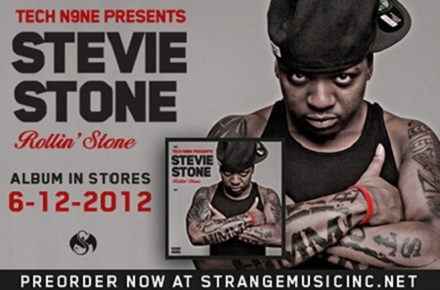 Press play and re-watch all of the action from Stevie Stone’s “808 Bendin” featuring Tech N9ne! How many times have you watched “808 Bendin”? What’s your favorite thing about the music video?